Hope you're having as productive/relaxing/enjoyable a rainy Sunday as I am. I did my taxes, watched an Oscar-nominated documentary, ate a fantastic salad, got a good chunk of homework done, and now I'm sitting by a fireplace while it rains outside. Heck yeah, weekends. So after a long night of struggling with some accounting homework, I lay down and listened to Mount Eerie's "Song Islands Vol. 2" through a pair of headphones, which was a fairly lovely and relaxing experience. Formerly known as The Microphones, Mount Eerie's Phil Elverum uses the recording process as another instrument, and listening to his music through headphones is really the way to go. Organic and intimiate songwriting, unlike anything else out today, draws you into its atmosphere of nature and wonder. I feel like I've probably posted this song before, but having just re-watched The Muppet Movie, I feel it needs to be listened to again. 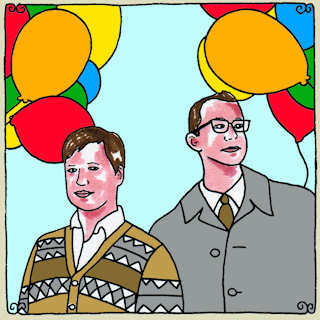 Things that Are Square superfavs Matmos have recorded a Daytrotter session. That's pretty rad. New, free music from a band I love the hell out of. Bonus points: Dan Deacon helped with the new tracks. Two great tastes that taste great together. Download both pieces here. I am really tickled that the new Best Coast video, instead of premiering on Pitchfork or Stereogum or whatever, is beginning its life on icanhascheezburger.com due to the high concentration of cute cats. And speaking of cute cats, how about that Beth Cosentino? HEY-oh! Happy Friday. Happier Friday to me, since I'm leaving at noon to go on tour with moon pearl. We're playing in San Luis Obispo tonight, SF tomorrow, Sacramento on Sunday, and driving home all smelly and happy on Monday. Tiny baby tour. Come see us play. It'll be fun. Anyway. I do a radio show. I play music. Bob Dylan writes good songs. I'm unsure why I have such an affinity for 90s indie rock. Despite being age appropriate, it's not like I have fond memories of it. When this album was released, I was in 8th grade and listening to Punk-o-Rama cassette comps. Must just hit some nerve in me. Also: Sebadoh will be playing this album in its entirety on their latest tour. I'm seeing them on February 25th at the Echoplex with my friends Emily and Kathy. Should be rad. The other night, I was having the "Beatles or Stones" debate with my friend Jessica. She was coming down on Team Stones, and I opposed. Eventually, I just said, "But you know it doesn't matter. The correct answer to 'Beatles or Stones' is 'The Velvet Underground.'" We were in agreement. She then added, "Exactly. Just like the correct answer to 'Oasis or Blur' is 'Pulp.'" That is why we're friends. In related news, how does ANYONE get away with the lyrics Jarvis Cocker writes? I'd get slapped if I sang half that stuff. Must be a confidence thing. In other related news: "Disco 2000" is one of my go-to karaoke jams.